Suffice to say, Sally is now a hairdresser. Sally’s training ended with a test evening here at the salon, where she gave a presentation of her work. This consisted of, first a funky little routine set to music where the models showed off their cuts and blowdries, then, Sally spoke to us, the audience, a little about each of the haircuts. Telling us, in her own humorous manner, how she’d gone about choosing the style, then executing the cut, and finally creating the blow dry. We all then retreated to The Sun while Helen went through Sally’s haircuts with, in her own words, a fine tooth comb. This took a while and we all waited nervously across the road as the models came in one by one after they had been checked off and graded. The suspense built as the time ticked and the drinks flowed until after about three quarters of an hour Sally and Helen burst in laughing and smiling with the good news that Sally had passed. News that we all celebrated with a champagne toast. This is great news for us at Helen Gee Hairdressing, as, since our new move we’ve had an influx of new clients, and now with us having five stylists to meet demand we can maintain the exacting standards we’ve set for ourselves, that our clients have come to expect. When asked how to describe her style Sally says she is unsure at this point how to put her style into words. However she works to an eclectic mix influenced by Helen and her many years of working in the hair and fashion industry. 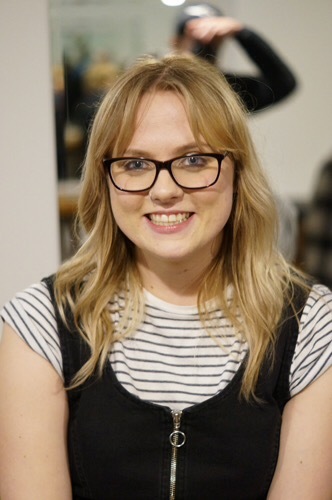 On joining the team in her new role, Helen believes that Sally will go on to develop her own style whilst maintaining the high standards reflecting the foundations of her training. With her bubbly personality, enthusiasm and work ethics I have no doubt that she will build her own client base within the salon and continue to be a very valued member of our team. Sally has asked me to take this opportunity to thank Helen for putting time, effort and patience into her training along with Zara and Kate. Plus, her brother Michael and sister-in-law Amy for being there with encouragement, support . . . and scampi ‘n’ chips.